I have been delaying this one for quite a bit. 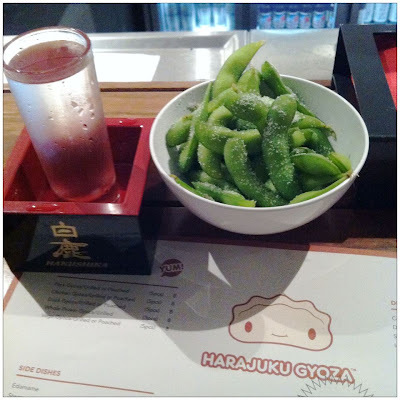 Everyone I know seems to be raving about Harajuku Gyoza and telling me how it is one of the most interesting/fun restaurant in Brisbane. Anyhow, knowing how long the queues could be, I went there for dinner on a rainy Friday evening a couple weeks ago and luckily, the restaurant was only half full. But before the meal was finished, I assure you, a line started to form outside the restaurant. Anyway, seated at the bar and pondering away, I waited for my hakushika sake and edamame along with grilled duck, grilled prawn and grilled pork dumplings. I do have to admit, for a gyoza bar, the variety of dumplings on offer are kind of limited. But then again, Harajuku Gyoza as the name suggest, is a gyoza bar and not a dumpling bar and they do offer side dishes to keep the variety interesting. In terms of flavour, I do think that their grilled duck and grilled prawn is pretty nice but the pork dumplings are not that special... Maybe a bit more flavour in the filling might assist? It is probably also noteworthy that Harajuku Gyoza is quite expensive. 3-5 grlled dumplings can set you back $8. For a gyoza fanatic like myself, I could probably devour about 12-15 gyozas in one meal? You can do the math how much it would cost to satisfy me in one meal. Overall, it was definitely a fun experience, but if you do go, go with lots of friends. hey Lauren, that's great to hear! More than happy to send you an email with some recommendations!